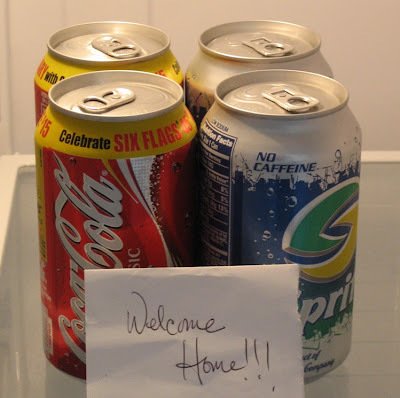 What a nice gesture: My new landlords left sodas (could they read my mind?) and a note inside the refrigerator at my new apartment. A. 's Google Talk away message right now is "back in sf (hallelujah!)." She is, understandably, excited to be back in San Francisco and living in her own place again, after an absence that relegated her to the East Bay. The message brought back memories of last spring, when I visited A. 's suburban Sacramento home to celebrate Easter. The annual observance of Christ's resurrection is an odd one for me. My family's not overly religious, but we have (almost) always marked Easter with donning white nylons for church, devouring baskets filled with chocolate and passing ham and blueberry muffins around the table at my grandparents' house. Those traditions hold sway over me and tend to catch me off-guard. I see Easter coming. It's there on the calendar. I know I won't be home. But I never adequately prepare for how lonely that will make me feel. Last year, I had a rare opportunity to do something other than hastily preparing a canned-ham dinner at 8 p.m. When A. invited me, in advance, to join her family's Easter celebration, I jumped on board. Lutheran church service? Pretty dresses? Homemade eats? Count me in. As the day approached, I wasn't quite as excited. Saturday dawned foggy and cool in San Francisco; not conducive to producing the energy needed to hit the road. I also felt more like just staying at home, in bed, on the couch, ordering take-out: V. and I had just started dating. No attraction is so intense, I swear, as those first few months. It always makes me almost incapable of doing anything except being in love. No other time, however, is it so important to remember one's independence. So hit the road I did, partly for Jesus, partly for me, with a copy of Madeleine Peyroux's "Careless Love" in my CD drive. It was a long drive, I remember -- cloudy all the way, and basically uninteresting, riddled with the inertia of leaving fresh romance several hours behind. In some ways, I felt like I was running away from the party; in others, I felt inadequate to be joining the next stop. I'd given nothing up for Lent. I'd barely been to church in something like seven years. Was I just pretending to be a good Christian? There I was, however, no matter how I felt. I had arrived, helped with laundry, eaten take-out food and watched a movie. On Sunday, we woke, slipped into nice outfits and drove to church. Here's the thing: One aspect of worship my home church hits out of the park is grandeur. Booming-pipe-organ-, celebratory-trumpet-style grandeur fit for the King of kings. We sing "A Mighty Fortress" on Reformation Sunday and host a guest brass ensemble for Palm Sunday. So I've got high standards, which made A. 's church a little calm for me, in general keeping with my so-far underwhelmed suburban weekend experience. Until, that is, the Hallelujah chorus. My small town church is located only a few blocks from my small town high school, which just so happened to have a phenomenal music program when I attended. Once every four years, the choir did Handel's "Messiah." What an amazing tradition, right? So it was to my heart's delight, that cold, cloudy Easter Sunday, when members of the congregation who knew the music to one of the warmest, grandest voice works ever composed were invited to join the singers in robes up front. Singing? In harmony? With real music sheets in front of me? It was like being in high school all over again. It still didn't quite feel like Easter, but if felt like something. After church we got lunch, broke out the jeans and went to the home of a friend of A. 's family for dinner. I left before the big meal got underway, to return to San Francisco with a roommate, his brother and his friend crammed into my car, before the big post-Easter rush. By the Bay, the sun was beginning to shine, my boyfriend was at work, and I felt a new kind of emptiness: not because I'd missed Easter, but because I'd been a part of it. 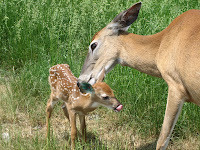 Last week, one of the female deer at Twin Kiss (a local fast food joint) had two buck fawns. I went with my brother, Kevin, last Thursday to see them. 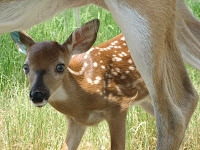 To our surprise, one of the fawns was quite social and came right up to the fence with its mother. What a birthday gift for me! My friend Elizabeth's digital photography business seems on the verge of opening. A far cry from the gutted space I saw a few weeks ago, the studio has fresh carpet, brushed silver door knobs, track lighting and mostly-assembled furniture. 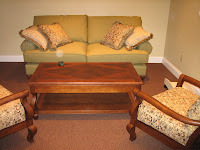 Check out these photos of the furniture (and its ultra-cool upholstery) and the excellent lighting.